At the core of all Polygon Physics products is a patented microwave discharge system that can ignite and maintain an electron cyclotron resonance (ECR) plasma at very low power consumption (~ 1W). This means we can use simple low power transmitters similar to those used in cell phones. The ECR concept, together with the ultracompact design of the cavities, enables the use arrays of individually controlled cavities in order to create a plasma sheet of any dimension. 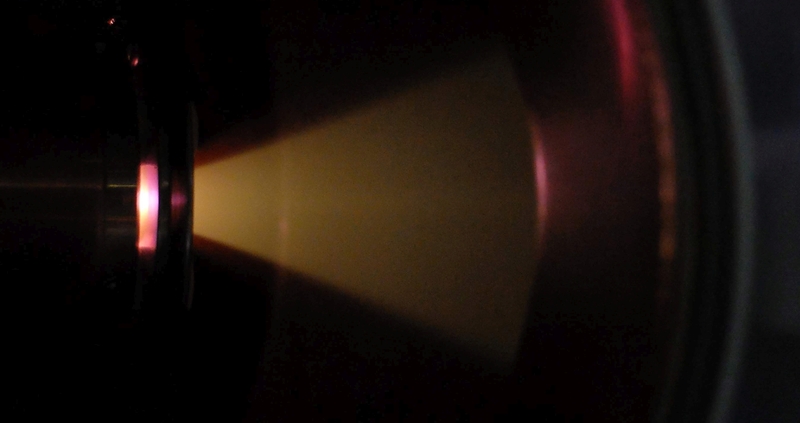 By adding extraction optics we can transform these plasmas into beams of ions or electrons of any shape and size. The core element of our products is a patented microwave discharge system as small as a thumb. The founders of Polygon Physics developed the first one in 2009 at a French research lab as a low cost microwave ion source for surface treatment purposes. Generally, when designing such a source, a magnetron is chosen as microwave power supply. This works nicely, but the coupling of the magnetron to the discharge chamber induces quite a lot of mechanical and microwave constraints (e.g. impedance matching). For COMIC they decided to use a transmitter comparable to the ones used inside cellular phones (peak power around 2 GHz, in the range of 1 W) with a matching resonant microwave cavity. At such low power the geometry needs to be very compact. The end result easily fits into the palm of your hand. An ECR plasma is a plasma generated with the help of a permanent magnetic field and a microwave, in such a way that free electrons can absorb the microwave power and heat up to the point that they can ionize the gas molecules. This happens when the microwave frequency matches the angular frequency of the electrons (resonance). where B is the magnetic flux density, e the electron charge, and m the electron charge. A nonzero velocity component parallel to the magnetic field will cause an electron to spiral along the field lines with a helical path. A nonzero velocity component in a different direction will result in a cycloidal type of path with a net drift perpendicular to the magnetic field. When sending in the microwave we add an alternating electromagnetic field perpendicular to the magnetic field. In the special case that the microwave frequency exactly matches the angular frequency of the electrons, the free electrons are continuously accelerated (‘heat up’) because they change direction in phase with the alternating electric field. For the microwave of 2.45 GHz that we use, this resonance condition is met for a magnetic field strength of 875 Gauss. When this condition is met, the input power is efficiently transferred to the electrons (maximum energy absorption of the supplied electric field). The free electrons can ionize gas molecules when they transfer sufficient energy in a collision to liberate an electron (the ionization energy for argon is for example about 16 eV). This means that the mean free path of the electrons needs to be long enough to have enough time to accelerate. In other words, the gas pressure cannot be too high. The ECR plasma cavity serves as the source of the ions or electrons that we make beams of. We extract the beams from the cavity with the help of electromagnetic fields. First of all, with permanent magnets around the cavity we induce a magnetic field gradient at the cavity exit. We also create an electric field at the cavity exit by applying a bias to the cavity. 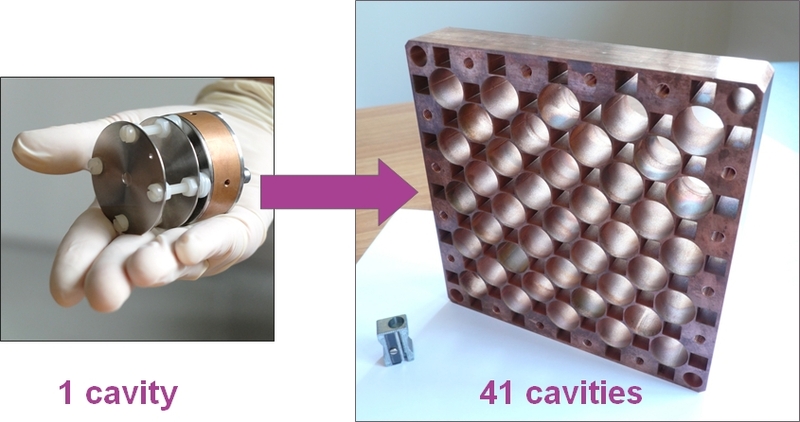 For ion beams the cavity is biased positively with respect to ground. For electron beams the cavity is brought to a negative potential. With the plasma cavity biased, also the microwave power to ignite and sustain the plasma has to be brought from ground to that potential. 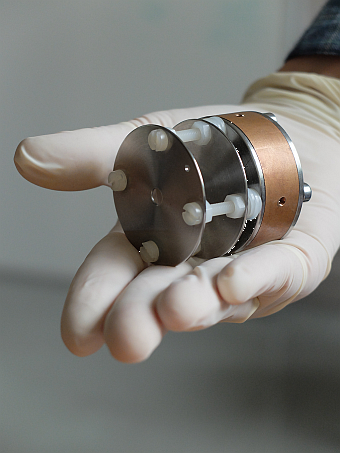 This is not always straightforward, but for the 2.45 GHz power we typically use, we have developed a very effective vacuum-compatible coaxial high voltage insulator. Different applications require different beam shapes. For example, ion beam figuring is often done with a focused beam to locally remove artefacts on a surface. On the other hand, surface cleaning is typically done with a broader beam. The beam shape can be tuned with ‘optics’. We typically use grid electrodes or aperture electrodes for beam shaping. With aperture electrodes contact between the beam and the electrode can be avoided. This is of interest for two reasons. First of all, sputtering of the electrode by the beam causes contamination. Secondly, electrode erosion limits the lifetime of the source. Key parameters for ion beams used for surface treatment processes are beam energy, and (variation of) current density of the beam across a given surface area. The maximum beam current that can be extracted from a single cavity source is ultimately limited by the applied microwave power and the gas ionization efficiency. Some applications require higher beam currents, or require a current density distribution different than a single cavity can deliver. In those cases cavity arrays are the solution. The reliability and stability of single ECR cavities enables the use of such arrays in multi-cavity sources to create beams of any size or shape. Examples are circular or rectangular broad ion beams for larger area batch treatments, or linear ion beams for roll-to-roll applications.